China apparently possesses a jet-propelled unmanned aerial vehicle that’s suitable for tests aboard a future, catapult-equipped aircraft carrier. The development means Beijing in theory could rapidly deploy fast drones aboard a planned class of large carriers, once the new vessels commission into service in the mid-2020s. The Tian Ying drone, a product of the China Aerospace Science and Industry Corporation, appeared in the public display at the biennial air show in Zhuhai in November 2018. Tian Ying is actually a family of drones, some of them having very little in common with the others. The Tian Ying that CASIC prominently displayed at Zhuhai is a jet-powered flying wing that reportedly is similar in scale to the U.S. Air Force’s RQ-170 surveillance drone, which has a 66-feet wingspan. CASIC announced the carrier-compatible Tian Ying’s first test flight in February 2018. “Eighty percent of our drone’s technologies are the newest and most advanced, some of which are leading the global [drone] industry,” said Ma Hongzhong, the UAV’s lead designer. Notably, the Tian Ying at Zhuhai has the bulky, heavy-duty landing gear that’s normally associated with aircraft designed to land aboard aircraft carriers with their arrestor wires and limited deck space. In that way, the Tian Ying might have more in common with the U.S. Navy’s former X-47B drone demonstrator, built by Northrop Grumman, than it does the Lockheed Martin-made RQ-170. With an apparent maximum take-off weight of around four tons, the land-based RQ-170 is light for its size. The 62-feet-wingspan X-47B with its arrestor hook and reinforced landing gear has a maximum take-off weight of around 20 tons. The Navy and Northrop flew a pair of X-47Bs in a multi-billion-dollar series of carrier trials between 2011 and 2017. In the summer of 2013, the X-47B completed the first carrier-landings and catapult-launches aboard the USS George H.W. Bush sailing off the U.S. East Coast. The data the Navy gathered has informed the $13-billion MQ-25 program, which aims to build 72 jet-powered aerial-refueling drones for carrier air wings beginning in the early 2020s. The sailing branch has hinted that the MQ-25 might evolve into other roles such as surveillance and surface-attack. The Chinese military would need to undertake its own at-sea trials before it could safely integrate drones into its carrier air wings. As American experience has proved, these trials are expensive and time-consuming. It’s unclear how serious the Chinese navy is about acquiring carrier drones or what missions the pilotless aircraft might perform. Corporate promotional art from China’s aviation and shipbuilding industries have depicted flying-wing drones launching from carriers. But the two flattops in service with the Chinese navy are incompatible with jet-powered drones, which likely require a catapult for launch. Type 001 Liaoning, a refurbished Ukrainian vessel and China’s first carrier, launches its aircraft by way of a ramp rather than a catapult. Type 001A Shandong, China’s second carrier, also only has a ramp. The Chinese navy’s third carrier, the Type 002 currently under construction in Shanghai, might have a catapult. 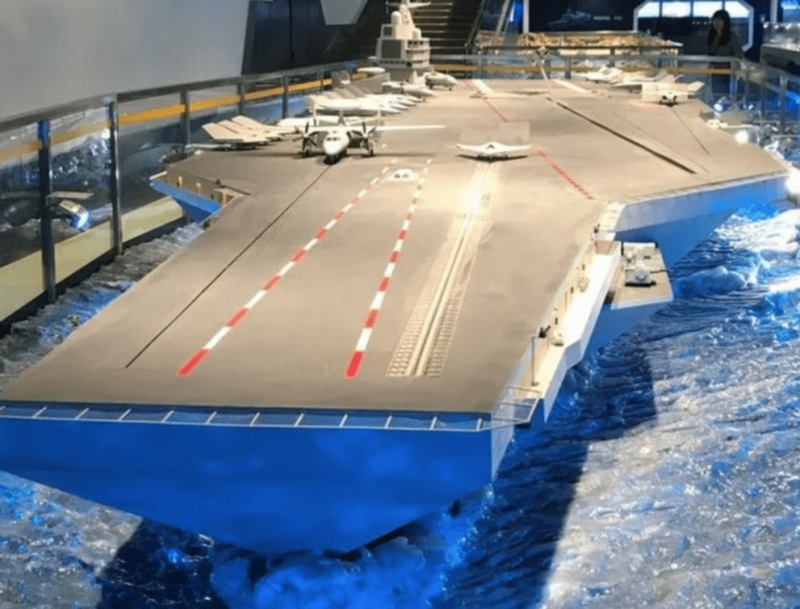 A mock-up of the conceptual, apparently nuclear-powered Type 003 carrier at the Military Museum of the Chinese People’s Revolution in Beijing includes catapults and has a Tian Ying-style drone in the launch position. But other evidence strongly hints that Beijing plans to develop a jet-powered, carrier-compatible drone — and deploy it in the 2020s around the same time Washington places its own carrier drones in front-line service.